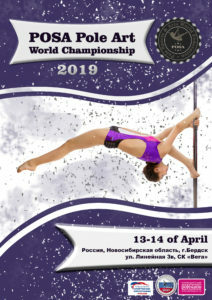 POSA is very pleased to begin the official collaboration with the Russian Sports Choreography Federation (RSCF), with the organization of the prestigious World Pole Art Championship 2019. This competition will take place in Novosibirsk, in the heart of Siberia, and will be attended by athletes from all over the world, who have qualified through the Official POSA Pole Arts around the world. Individual photos 35 € for athlete. If you want to get the photos, please mark it in the application form. Photos must be paid with competition fee before 14.03.19.